Don't make the mistake of letting an algorithm overestimate or underestimate your home's value. 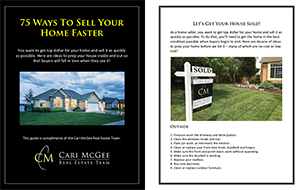 Let the Cari McGee Real Estate Team research recent sales of similar homes in your neighborhood and analyze where the market is going. We'll share the results with you so you can make a more informed decision on your listing price -- all for free, and with no obligation. By completing this home valuation request, we'll give you immediate access to an 8-page brochure with dozens of tips to help you get your home ready to sell. We share room-by-room advice that will help make your home the one that buyers fall in love with when they see it! Items with a red asterisk are required so we can reply to your request. By submitting this form with your telephone number you are consenting for the Cari McGee Real Estate Team and authorized representatives to contact you even if your name is on the Federal Do-not-call List. Please include a phone number where we can contact you. With the rise of spam filtering, email is not the most reliable method of communicating. If "yes," please indicate who. Describe any special amenities that you think would add to your home's value. Also list any upgrades that have been done and when they were done.